Try our Aquamarine Satisfaction Guarantee - compare our prices and our superior quality. Click on any genuine aquamarine image below to enlarge it. This natural aquamarine gemstone was precision faceted into this calibrated 9.1mm heart shape gem with excellent brilliance from a natural aquamarine crystal that was mined in Brazil. This fine quality aquamarine gemstone is completely clean under close inspection (GIA: Type I Gem, Clarity Grade: Flawless), and it has beautiful light blue natural color. This heart shape aquamarine gemstone would make a very beautiful aquamarine necklace! This natural aquamarine gemstone is unheated and untreated. Aquamarine Crystal Dimensions: 1.6" x 1.6" x 1.3"
This naturally terminated aquamarine crystal is transparent in the middle and upper parts and becomes semi-transparent near its base. It has natural pale blue color, and its prismatic faces and terminations are in very good condition. See also a back-view photo of this naturally terminated aquamarine crystal. This naturally terminated aquamarine crystal makes a great specimen of pale blue natural color aquamarine just as it is, although it would also yield a single giant very nice lightly included cabochon gem weighing 200 carats! This natural aquamarine jewelry design was handcrafted in pure sterling silver and set with a 27x16mm oval shape cabochon gem of semi-transparent to transparent light blue-green color aquamarine (100% natural color: this natural aquamarine gemstone is unheated and untreated). This natural aquamarine jewelry design was handcrafted in pure sterling silver and set with a 23x16mm pear shape cabochon gem of translucent light blue color aquamarine (100% natural color: this natural aquamarine gemstone is unheated and untreated). This large size natural aquamarine pendant was handcrafted in 925 sterling silver and set with a 20x16mm checkerboard-top faceted cabochon gem of translucent gray-blue aquamarine (100% natural color: this natural aquamarine gemstone is unheated and untreated). This natural aquamarine pendant was handcrafted in sterling silver and set with a 21x13mm oval shaped checkerboard-top cabochon gem of translucent to semi-transparent light greyish-blue color aquamarine (100% natural color: this natural aquamarine gemstone is unheated and untreated). This unique aquamarine jewelry design was handcrafted in 925 sterling silver. There are eleven rough pieces of mostly transparent medium blue natural color raw aquamarine measuring from 9x6mm at each end up to 14x13mm in the center of the necklace. Each aquamarine piece is unheated and untreated. The aquamarines in this unique necklace are bezel set with open back settings. See another close-up view of this natural color aquamarine necklace. See also a full view of this natural aquamarine necklace. This unique aquamarine jewelry design was handcrafted in 925 sterling silver and bezel set with an open back setting around a 16x10mm rough piece of mostly transparent medium blue natural color raw aquamarine. This natural aquamarine is unheated and untreated. This unique aquamarine jewelry design was handcrafted in 925 sterling silver and bezel set with an open back setting around a 14x13mm rough piece of transparent medium blue natural color raw aquamarine. This is a very beautiful lightly included natural aquamarine. It is unheated and untreated. This unique aquamarine jewelry design was handcrafted in 925 sterling silver and set with two rough pieces of transparent pale blue natural color aquamarine with gem grade areas, and with a 4mm round faceted colorless topaz gemstone. The aquamarines and the topaz are all unheated and untreated. This unique aquamarine jewelry design was handcrafted in 925 sterling silver and set with a 16x10mm rough piece of transparent pale blue natural color aquamarine with gem grade areas, and with a 9x7mm oval faceted aquamarine gemstone. The aquamarines are both unheated and untreated. The 9x7mm aquamarine gemstone faces up eye clean with faint natural inclusions only visible under close inspection with bright illumination. This large sterling silver pendant was handcrafted and set at the top with a 30x25mm checkerboard-top cabochon gem of translucent to semi-transparent light grayish-blue color aquamarine (100% natural color: this genuine aquamarine gemstone is unheated and untreated). Below the aquamarine is a 19x12mm cabochon gem of light greenish-blue natural color larimar, and below the larimar gem is an 8x6mm oval shaped faceted gem of sky-blue topaz. This extra large size aquamarine jewelry pendant measures 2.5 inches long! This genuine aquamarine crystal pendant was handcrafted in 925 sterling silver and set with a 1.1 inch long (29mm long) aquamarine crystal with yellow (heliodor) and green (aquamarine) natural colors: this genuine aquamarine crystal is unheated and untreated. The aquamarine crystal is naturally terminated with terminations in very fine condition. It is mostly transparent with small gem-grade areas inside! Natural aquamarine crystal pendant with an aquamarine crystal weighing 55 carats! This genuine aquamarine crystal pendant was handcrafted in 925 sterling silver and set with a 2 inch long (50mm long) aquamarine crystal with green and blue-green natural colors: this genuine aquamarine crystal is unheated and untreated. The aquamarine crystal is naturally terminated and it is mostly transparent with small gem-grade areas inside! This unique pair of 925 sterling silver dangle style aquamarine earrings is set with natural aquamarine faceted gemstones with pale greenish blue natural color - these genuine aquamarine gems are unheated and untreated. This oval shape aquamarine jewelry design is set with natural aquamarine gems that weigh 2.40 carats each (4.80 carats total weight). These beautiful aquamarine gemstones face up clean, and under close inspection they show just a few faint natural inclusions. See also another view of these genuine aquamarine earrings. The 925 sterling silver settings have handcrafted designs - see also a side view of these natural color aquamarine earrings in sterling silver. This beautiful pair of 925 sterling silver dangle style aquamarine earrings is set with natural color light blue aquamarine faceted beads - these genuine aquamarine gems are unheated and untreated! This natural aquamarine jewelry design is set with three genuine aquamarine beads measuring 4.5mm, 5.5mm, and 6.5mm in diameter that weigh 3.5 carats total weight in each earring (7.0 carats total aquamarine weight for the pair). These superior quality aquamarine faceted beads are transparent and show very faint natural inclusions only when examined very closely! This unique pair of 925 sterling silver dangle style aquamarine earrings was handcrafted and set with 9x7mm natural aquamarine faceted gemstones with light icy blue natural color - these genuine aquamarine gems are unheated and untreated. These beautiful aquamarine gemstones face up clean, and under close inspection they show just a few faint natural inclusions. This superior quality aquamarine jewelry design is set with genuine aquamarine gemstones that weigh 2.30 carats each (4.60 carats total weight). This solid 14k yellow gold aquamarine ring is a ring size 6 1/2. This solitaire ring has 2.46 grams of solid 14k gold with a heart shape design on each side of the ring. It is set with a natural aquamarine gemstone with beautiful pale icy blue natural color - this aquamarine gem is unheated and untreated. The fine quality gem in this natural aquamarine ring is completely eye clean even under very close inspection. It is very well faceted with good proportions from a natural aquamarine crystal that was mined in Brazil. See another view of this natural aquamarine ring design. This solid 14k white gold aquamarine ring is a ring size 6 1/2. This solitaire ring has 2.65 grams of 14k gold. It is set with a natural aquamarine gemstone with very beautiful light blue natural color - this aquamarine gem is unheated and untreated. See another view of this natural aquamarine jewelry design. The trillion cut gem in this natural aquamarine ring faces up eye clean, with just a few very faint natural inclusions that are only visible under very close inspection. This superior grade aquamarine gem is exceptionally well faceted with very good brilliance from a natural aquamarine crystal that was mined in Brazil. This solid, heavy 14k yellow gold aquamarine ring is a ring size 5. This solitaire ring has over 8 grams of 14k gold. It is set with a natural aquamarine gemstone with very beautiful medium greenish-blue natural color. This aquamarine gem is unheated and untreated. See another view of this natural aquamarine jewelry design. See also another view of this natural aquamarine jewelry design. The Marquise cut gem in this natural aquamarine ring is completely eye clean. It is exceptionally well faceted with very good brilliance from a natural aquamarine crystal that was mined in Brazil. This is a solid 14k yellow gold aquamarine ring in a ring size 6 1/2. This filagree ring style has 3.6 grams of 14k gold! This beautiful ring is set with a natural aquamarine gemstone with beautiful light blue natural color, it is unheated and untreated. This round faceted shaped aquamarine gem faces up clean, with faint natural inclusions only visible under close inspection. This beautiful gem is very well faceted with excellent brilliance from a genuine aquamarine crystal that was mined in Brazil. This 14k white gold aquamarine ring is a ring size 6 with 2.08 grams of 14k gold. It is set with a natural aquamarine gemstone with very beautiful light blue natural color. The pear shape gem in this natural aquamarine ring is very well faceted with very good brilliance. This fine quality gem is completely clean even under close inspection with magnification! 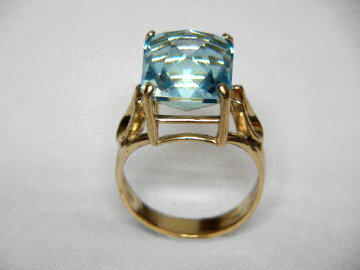 This 14k yellow gold aquamarine ring is a ring size 6 3/4. This beautiful ring is set with a natural aquamarine gemstone with very beautiful light to medium blue color (100% natural color). This custom faceted, radiant style, octagon shaped aquamarine gem is eye clean and it was very well faceted, with a small diamond shaped table, with excellent brilliance. It was fashioned from a genuine aquamarine crystal that was mined in Brazil. See also another view. This 14k white gold aquamarine ring is a ring size 6-1/2. It is set with a natural aquamarine gemstone with beautiful pale blue natural color. The oval shape gem in this natural aquamarine ring is very well faceted with very good brilliance. This fine quality gem is completely clean even under close inspection with magnification! This solid, 14k yellow gold aquamarine ring is a ring size 6. This ring has over 4.4 grams of 14k gold. It is set with a natural pale blue aquamarine gemstone with very beautiful natural color. This aquamarine gem is unheated and untreated. It is surrounded with 12 beautiful 3 mm round natural blue sapphires of medium deep blue color. See another view of this natural aquamarine jewelry design. See also another view of this natural aquamarine jewelry design. The oval cut gem in this natural aquamarine ring is completely eye clean. It is exceptionally well faceted with very good brilliance from a natural aquamarine crystal that was mined in Brazil. This unique aquamarine ring was handcrafted in 925 sterling silver and set with a 19x13mm free-form shape cabochon gem of translucent grayish blue aquamarine. The cabochon gem in this genuine aquamarine ring has a checkerboard faceted top. It is 100% natural color, and it is both unheated and untreated. This natural aquamarine ring was handcrafted in 925 sterling silver and set with an 21x19mm checkerboard-top cabochon gem of translucent to semi-transparent light blue color aquamarine (100% natural color: this genuine aquamarine gemstone is unheated and untreated). This genuine aquamarine ring is set with an 8mm trillion cut gem of genuine aquamarine with pale greenish-blue natural color: this genuine aquamarine gemstone is unheated and untreated. This natural aquamarine jewelry design was handcrafted in fine 925 sterling silver. This unique green aquamarine ring is set with an 18x18mm checkerboard faceted gem of light green natural color aquamarine. This natural green aquamarine jewelry design was handcrafted in fine 925 sterling silver. This included aquamarine gem is semi-transparent to transparent. See a front view of this natural green aquamarine ring. The aquamarine gem has very beautiful natural light green color: it is unheated and untreated. This heavy aquamarine ring has 5.4 grams of 925 sterling silver. This unique aquamarine ring is set with a 25x15mm faceted pear shape gem of light to medium blue natural color aquamarine. This natural aquamarine jewelry design was handcrafted in fine 925 sterling silver. This large size lightly included aquamarine gem is transparent, and it measures one inch long! See a side view of this natural aquamarine jewelry design. 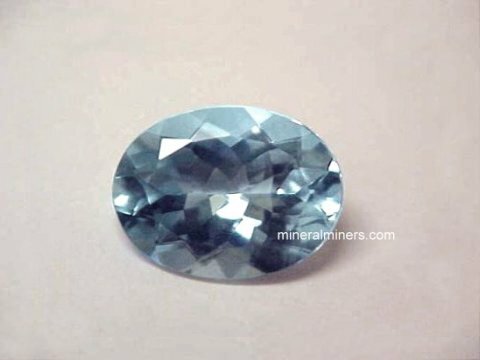 The aquamarine gem has beautiful natural color: it is unheated and untreated. This extra heavy style aquamarine ring has 10.3 grams of 925 sterling silver. This unique aquamarine ring is set with a 27x19mm checkerboard faceted oval shape gem of light greenish-blue natural color aquamarine weighing 46 carats! This natural aquamarine jewelry design was handcrafted in fine 925 sterling silver. This extra large size lightly included aquamarine gem is actually transparent. See a side view of this natural aquamarine jewelry design. The aquamarine gem has beautiful natural color: it is unheated and untreated. This extra heavy style aquamarine ring has 15.3 grams of 925 sterling silver. This beautiful aquamarine pendant is set in 14k yellow gold with a natural aquamarine gemstone with light blue natural color - this natural aquamarine gem is unheated and untreated. This heart shape aquamarine jewelry design is set in solid 14k yellow gold. The beautiful aquamarine gem is very well faceted and it faces up clean, with very faint natural inclusions only visible under close inspection. This beautiful gem was faceted from a natural aquamarine crystal that was mined in Brazil. See also another view of this natural natural aquamarine pendant. This unique aquamarine pendant is set in solid 14k yellow gold with a natural aquamarine gemstone with light greenish blue natural color - this natural aquamarine gem is unheated and untreated. This heart shape aquamarine jewelry design is set in a solid 14k yellow gold setting that weighs 1.90 grams. This beautiful aquamarine gem is very well faceted with exceptionally fine brilliance, and it faces up completely eye clean (GIA: Type I, Clarity Grade: VS). This fine quality gem was faceted from a natural aquamarine crystal that was mined in Brazil. See also another view of this natural color large heart shape aquamarine pendant. This unique aquamarine pendant is set in solid 14k yellow gold with a natural aquamarine gemstone with pale greenish blue natural color - this natural aquamarine gem is unheated and untreated. This heart shape aquamarine jewelry design is set in a solid 14k yellow gold setting that weighs 1.76 grams. This beautiful aquamarine gem is very well faceted with very fine brilliance, and it is completely clean even under close inspection with magnification (GIA: Type I, Clarity Grade: VVS+). This fine quality gem was faceted from a natural aquamarine crystal that was mined in Brazil. 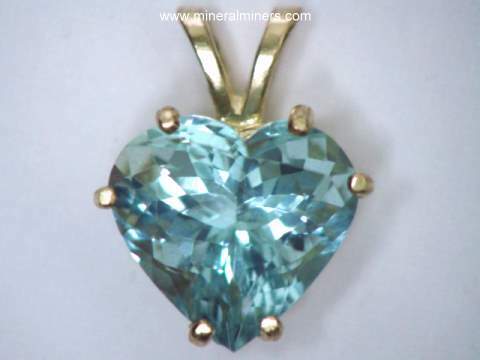 See a side view of this natural aquamarine heart shape pendant. This flawless aquamarine heart pendant will make a wonderful aquamarine necklace! This one-of-a-kind aquamarine pendant is set in 14k yellow gold with a natural aquamarine gemstone with light to medium blue natural color - this natural aquamarine gem is unheated and untreated. This heart shape aquamarine jewelry design is set in a solid 14k yellow gold setting that weighs 1.81 grams. This fine quality aquamarine gem is very well faceted and it is completely clean even under very close inspection (GIA: Type I, Clarity Grade: VVS). It was faceted from a natural aquamarine crystal that was mined in Brazil. 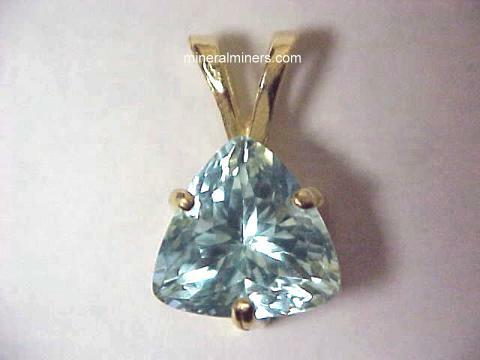 See another view of this natural color natural aquamarine pendant. See also a side view of this beautiful aquamarine heart pendant. This 14k yellow gold aquamarine pendant is set with a natural aquamarine gemstone with medium blue natural color - this natural aquamarine gem is unheated and untreated. It is very rare for a small aquamarine gem to have such rich blue natural color. This beautiful aquamarine gem is completely eye clean. It will make a wonderful aquamarine necklace! This natural aquamarine gemstone is very well faceted as a pear shape gemstone. This unique aquamarine pendant is set in 14k yellow gold with a natural aquamarine gemstone with light blue natural color - this natural aquamarine gem is unheated and untreated. This round faceted aquamarine jewelry design is set in solid 14k yellow gold. The beautiful aquamarine gem is very well faceted with superb brilliance, and it faces up clean (GIA: Type I, Clarity Grade: VS). This fine quality gem was faceted from a natural aquamarine crystal that was mined in Brazil. This natural aquamarine pendant is set in 14k yellow gold with a natural aquamarine gemstone with light blue natural color - this natural aquamarine gem is unheated and untreated. This trillion cut aquamarine jewelry design is set in solid 14k yellow gold. The beautiful aquamarine gem is very well faceted and faces up eye clean. It was faceted from a natural aquamarine crystal that was mined in Brazil. See also another view of this natural aquamarine jewelry design. This natural aquamarine pendant is set in 14k yellow gold with a natural aquamarine gemstone with light blue natural color - this natural aquamarine gem is unheated and untreated. This rectangular cut aquamarine jewelry design is set in solid 14k yellow gold. The beautiful aquamarine gem is very well faceted and it is eye clean. It was faceted from a natural aquamarine crystal that was mined in Brazil. See also another view of this natural aquamarine jewelry design. This lovely aquamarine pendant is set with natural aquamarine gem with pale greenish-blue color that is 100% natural color, this aquamarine gem has not been heated or treated in any way. The beautiful gem in this genuine aquamarine pendant faces up eye clean, with faint natural inclusions only visible under very close inspection (GIA: Type I Gem, Clarity Grade: VS). This natural aquamarine jewelry design is set in solid 14k yellow gold. The natural aquamarine gem in this beautiful pendant was very well faceted with good brilliance from an aquamarine crystal that was mined in Brazil. This 14k yellow gold aquamarine pendant is set with a natural aquamarine gemstone with beautiful pale blue-green color (100% natural color - it is unheated and untreated). This eye clean aquamarine was very well faceted with excellent brilliance into this triangular shaped gem from a natural aquamarine crystal that was mined in Brazil. This trillion cut aquamarine jewelry design is set in solid 14k yellow gold. This 14k yellow gold aquamarine pendant is set with a 7mm princess square cut natural aquamarine gemstone with very beautiful light blue color (100% natural color - this genuine aquamarine gemstone is both unheated and untreated). This fine quality aquamarine gem is very well cut with good brilliance. This lovely aquamarine gem faces up clean, with faint natural inclusions only visible under very close inspection (GIA; Type I Gem, Clarity Grade VS). This natural color green aquamarine pendant is set in 14k white gold with a natural aquamarine gemstone with wonderful light green natural color - this natural aquamarine gem is unheated and untreated. It will make a very beautiful pale green aquamarine necklace! This oval cut aquamarine jewelry design is set in a solid 14k white gold setting. The aquamarine gem is completely clean even under very close inspection (GIA: Type I, Clarity Grade: VVS). This fine quality green aquamarine gemstone was very well faceted from a natural color green aquamarine crystal that was mined in Brazil. See also a side view of this natural green aquamarine jewelry design. This genuine aquamarine pendant is set in solid 14k yellow gold with a natural aquamarine gemstone with beautiful pale greenish blue natural color - this genuine aquamarine gem is unheated and untreated. This large size natural aquamarine gem has an almost colorless icy look! It will make a very beautiful aquamarine necklace. This cushion cut aquamarine jewelry design is set in a solid 14k yellow gold setting weighing 2.4 grams! The aquamarine gem is completely clean even under very close inspection (GIA: Type I, Clarity Grade: VVS). This fine quality aquamarine gemstone was very well faceted from a natural aquamarine crystal that was mined in Brazil. See also a side view photo of this natural aquamarine jewelry design. This natural aquamarine pendant is set in 14k yellow gold with a natural aquamarine gemstone with wonderful pale icy blue natural color - this natural aquamarine gem is unheated and untreated. This oval faceted aquamarine jewelry design is set in a solid 14k yellow gold setting. The superior quality aquamarine gem is completely eye clean (GIA: Type I, Clarity Grade: VS). This beautiful aquamarine gemstone is very well faceted with superior brilliance! It was cut from a natural aquamarine crystal that was mined in Brazil. Unique aquamarine pendant with an aquamarine gem weighing 16.51 carats! This natural color aquamarine pendant is set in 14k white gold with a beautiful aquamarine gemstone with very pale icy blue natural color that is almost colorless. This natural aquamarine gem is unheated and untreated. This oval faceted aquamarine jewelry design is set in a solid 14k white gold setting weighing 3.0 grams! This rare quality aquamarine gem is completely clean even under very close inspection (GIA: Type I, Clarity Grade: VVS). This fine quality aquamarine gemstone was very well faceted with good brilliance from a natural aquamarine crystal that was mined in Brazil. This genuine aquamarine pendant is set in solid 14k yellow gold with a natural aquamarine gemstone with lovely pale icy blue color (almost colorless). This beautiful aquamarine gem has 100% natural color - it is unheated and untreated! It is completely eye clean even under close inspection with bright illumination. The gem in this genuine aquamarine pendant is very well cut in an oval shape from a natural aquamarine crystal that was mined in Minas Gerais, Brazil. This genuine aquamarine pendant is set in 14k white gold with a natural aquamarine gemstone with pale icy blue natural color - this natural aquamarine gem is unheated and untreated. See also a side view of this natural color aquamarine 14k white gold pendant. This pear shape aquamarine jewelry design is set in solid 14k white gold. The aquamarine gem faces up eye clean, with faint natural inclusions only visible under close inspection with bright illumination (GIA: Type I, Clarity Grade: VS). This beautiful aquamarine gemstone was cut from a natural aquamarine crystal that was mined in Brazil. It will make a very nice aquamarine necklace! This natural aquamarine pendant is set in 14k white gold with a natural aquamarine gemstone with light blue natural color - this natural aquamarine gem is unheated and untreated. See also another view of this natural aquamarine pendant. This baguette cut aquamarine jewelry design is set in solid 14k white gold. The aquamarine gem faces up eye clean, with very faint natural inclusions only visible under close inspection with bright illumination (GIA: Type I, Clarity Grade: VS). This beautiful aquamarine gemstone is very well faceted. It was cut from a natural aquamarine crystal that was mined in Brazil. See also a different view photo of this natural aquamarine jewelry design. It will make a very fine aquamarine necklace! This unique aquamarine pendant is set in solid 14k yellow gold with a natural aquamarine gemstone with natural icy pale blue color - this genuine aquamarine gem is unheated and untreated. This round faceted aquamarine jewelry design is set in a solid 14k yellow gold setting weighing 1.34 grams. The superior quality aquamarine gem is eye clean (GIA: Type I, Clarity Grade: VS). 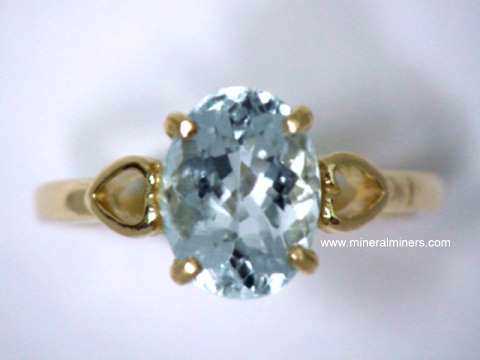 This beautiful aquamarine gemstone is exceptionally well faceted in a Portuguese round cut with very fine brilliance! See also a front view of this wonderful large aquamarine pendant. This beautiful aquamarine gem was expertly cut from a natural aquamarine crystal that was mined in Brazil. This genuine aquamarine pendant is set in 14k white gold with a natural aquamarine gemstone with beautiful light blue natural color - this natural aquamarine gem is unheated and untreated. See also a side view of this large aquamarine 14k white gold pendant. This oval cut aquamarine jewelry design is set in solid 14k white gold. The aquamarine gem is completely eye clean (GIA: Type I, Clarity Grade: VVS). This beautiful aquamarine gemstone is very well faceted with excellent brilliance! It was cut from a natural aquamarine crystal that was mined in Brazil. It will make a wonderful aquamarine necklace! This natural aquamarine pendant was handcrafted in solid 14k yellow gold and set with a fine quality 3mm round natural white diamond up above a large natural aquamarine gemstone with pale greenish blue natural color - this beautiful aquamarine gem is unheated and untreated. 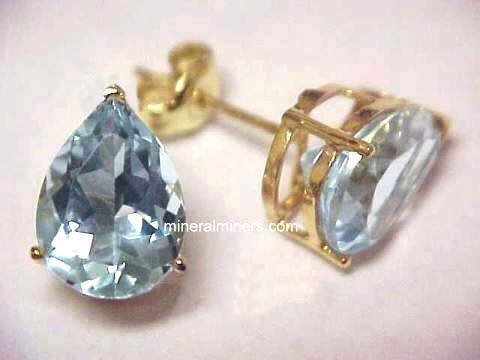 This oval faceted aquamarine jewelry design is set in a solid 14k yellow gold setting weighing 1.10 grams. The aquamarine gem is very well cut with good brilliance and faces up eye clean (GIA: Type I, Clarity Grade: VS), with faint natural inclusions only visible under close inspection with bright illumination. See also a side view photo of this natural aquamarine jewelry design. This wonderful aquamarine gem was cut from a natural aquamarine crystal that was discovered in Brazil. This large size aquamarine pendant is set in 14k yellow gold with a natural aquamarine gemstone with light greenish blue natural color - this natural aquamarine gem is unheated and untreated. See also a side view of this large aquamarine pendant. This checkerboard oval cut aquamarine jewelry design is set in solid 14k yellow gold. This fine quality aquamarine gem faces up eye clean (GIA: Type I, Clarity Grade: VS) with faint natural inclusions only visble under close inspection with bright illumination. This beautiful aquamarine gemstone is very well faceted with superb brilliance! It was cut from a natural aquamarine crystal that was mined in Brazil. This natural aquamarine pendant will make a fantastic aquamarine necklace! This unique aquamarine pendant is set in 14k white gold with a natural aquamarine gemstone with icy light blue natural color - this natural aquamarine gem is unheated and untreated. See also a side view of this aquamarine white gold pendant. This cushion cut aquamarine jewelry design is set in solid 14k white gold. This beautiful aquamarine gem faces up eye clean (GIA: Type I, Clarity Grade: VS) with faint natural inclusions only visible under close inspection with bright illumination. This beautiful aquamarine gemstone was cut from a natural aquamarine crystal that was mined in Brazil. This natural aquamarine pendant is set in solid 14k yellow gold with a natural aquamarine gemstone with very beautiful pale icy blue color (100% natural color - this natural aquamarine gem is unheated and untreated). This trillion cut aquamarine jewelry design is set in a solid 14k yellow gold setting weighing 1.50 grams. This beautiful aquamarine gem faces up completely clean (GIA: Type I, Clarity Grade: VS). This fine aquamarine is very well faceted with excellent brilliance in this triangular cut. It was faceted from a natural aquamarine crystal that was mined in Brazil. See also a side view photo of this natural aquamarine jewelry design. This large aquamarine pendant is set in solid 14k gold with a beautiful aquamarine gem with wonderful light blue color that is 100% natural color, it has not been heated or treated in any way. The superior quality gem in this genuine aquamarine pendant faces up eye clean with faint natural inclusions visible only under very close inspection with bright illumination (GIA: TYPE I Gem, Clarity Grade: VS). This fine aquamarine jewelry design is set in solid 14k yellow gold. See also a side view photo of this large natural color aquamarine jewelry design. The aquamarine gemstone in this beautiful pendant was very well faceted from a natural aquamarine crystal that was mined in Minas Gerias, Brazil. This fine aquamarine pendant measures 0.9 inches long (24mm long), and the aquamarine gem itself is 0.55 inches long (13.8mm long). This large aquamarine pendant is set with a fine quality aquamarine gem with wonderful light blue natural color, it has not been heated or treated in any way. The superior quality gem in this genuine aquamarine pendant faces up eye clean with faint natural inclusions visible only under very close inspection with bright illumination (GIA: TYPE I Gem, Clarity Grade: VS). This fine aquamarine jewelry design is set in solid 14k yellow gold. See also a side view photo of this natural aquamarine jewelry design. The aquamarine gemstone in this beautiful pendant was very well faceted from a natural aquamarine crystal that was mined in Minas Gerias, Brazil. This fine aquamarine pendant measures 0.9 inches long (24mm long), and the aquamarine gem itself is 0.6 inches long (14.7mm long). Natural aquamarine pendant with aquamarine gem weighing 21.1 carats! This unique aquamarine pendant is 1.5 inches long! This natural aquamarine pendant is set with a 28x11mm baguette cut aquamarine gemstone with beautiful icy light blue natural color! This genuine aquamarine gemstone is both unheated and untreated. This natural aquamarine gem is very well cut with good brilliance. This amazing gem faces up clean as shown at left (GIA; Type I Gem, Clarity Grade VS). See another view of this wonderful aquamarine jewelry design. When examined closely at a certain angle, this beautiful gem shows some very faint tiny natural reflector inclusions within its depths (see a photo of this large aquamarine pendant showing the very faint natural inclusions). This genuine aquamarine jewelry design is set in a solid 14k white gold handcrafted setting. See also a side view photo of this wonderful ex-large size aquamarine jewelry design. This natural aquamarine pendant is set in 14k white gold with a natural aquamarine gemstone with pale blue natural color - this natural aquamarine gem is unheated and untreated. This round cut aquamarine jewelry design is set in solid 14k white gold. This fine quality aquamarine gem is very well faceted with excellent brilliance, and it is completely clean (GIA: Type I, Clarity Grade: VVS) even under very close inspection! This beautiful gem was faceted from a natural aquamarine crystal that was mined in Brazil. See also a side view of this natural color aquamarine 14k white gold pendant. This aquamarine pendant is set in solid 14k yellow gold with afine quality aquamarine gem with wonderful light blue color that is 100% natural color, it has not been heated or treated in any way. The superior quality gem in this genuine aquamarine pendant is completely eye clean even under very close inspection with bright illumination (GIA: TYPE I Gem, Clarity Grade: VVS). This fine aquamarine jewelry design is mounted in a custom made solid 14k yellow gold setting. The gemstone in this beautiful aquamarine pendant was very well faceted from a natural aquamarine crystal that was mined in Minas Gerias, Brazil. This fine aquamarine pendant measures 0.7 inches long (18mm long), and the aquamarine gem itself is 0.44 inches long (11.3mm long). This beautiful aquamarine pendant is set with a fine quality natural aquamarine gem with light to medium blue 100% natural color, this aquamarine gem has not been heated or treated in any way. The superior quality gem in this genuine aquamarine pendant is completely eye clean (GIA: Type I Gem, Clarity Grade: VVS). This fine aquamarine jewelry design is set in solid 14k yellow gold! The natural aquamarine gem in this beautiful pendant is very well cut with superior brilliance. It was faceted from a natural aquamarine crystal that was mined in Brazil. See also another view of this fine natural aquamarine 14k jewelry design. This genuine aquamarine pendant is set in solid 14k white gold with a natural aquamarine gemstone with very pale greenish-blue icy color (almost colorless). This beautiful aquamarine gem has 100% natural color - it is unheated and untreated! This superior quality gem is very well faceted with excellent brilliance, and it faces up completely eye clean. Under very close inspection with bright illumination it shows just a few faint natural inclusions. The gem in this genuine aquamarine pendant is faceted in a round shape from a natural aquamarine crystal that was mined in Minas Gerais, Brazil. This 14k gold aquamarine pendant is set with three natural aquamarine gemstones with beautiful light blue color (100% natural color - these natural aquamarine gems are unheated and untreated). This superior quality aquamarine jewelry design is set in solid 14k white gold. These fine quality aquamarine gems are eye clean, and they are very well faceted in round brilliant cuts with excellent brilliance! This natural color aquamarine pendant is set in a 14k yellow gold setting with 3.0 grams of solid 14k gold! This large aquamarine gemstone weighs 12.60 carats. This aquamarine gem has very pale greenish-blue natural icy color (almost colorless). This wonderful aquamarine gem is completely natural with no heating and no treatments of any kind. This beautiful gem is very well cut with very good brilliance, and it is completely eye clean! This large aquamarine jewelry design is set in solid 14k yellow gold. This unique aquamarine bracelet was handcrafted from natural color transparent aquamarine crystals! Each of the lightly included beads was hand-ground into free-form shapes & then polished, drilled & strung into this one-of-a-kind aquamarine bracelet fit with sterling silver clasp & a one inch extender chain. The transparent beads are lightly included, and the beads are gradational in size measuring 10mm long at the clasp and increasing up to 13mm long at the center of the bracelet, and then back down to 10mm again, with 61 carats total weight of natural color aquamarine beads. This aquamarine bracelet has an adjustable length from 7" to 8.5"
This beautiful aquamarine bracelet was handcrafted in sterling silver and then bezel set with open back settings. It is set with five translucent to semi-transparent checkerboard-top faceted cabochon gemstones of natural aquamarine measuring from 20x17mm up to 28x24mm each, with a total gemstone weight of 110 carats! These large size genuine aquamarine cabochons have light grayish-blue natural color (they are unheated and untreated). The photo at left shows a close-up of this natural aquamarine bracelet. See also a full view photo of this handcrafted aquamarine bracelet. This aquamarine bracelet has an adjustable length from 7" to 8.75"
This beautiful aquamarine bracelet was handcrafted in sterling silver and then bezel set with open back settings. It is set with five translucent to semi-transparent checkerboard-top cabochon gemstones of natural aquamarine measuring from 24x18mm up to 26x22mm, with a total gemstone weight of 122 carats! These large size genuine aquamarine cabochons have light greenish-blue natural color (they are unheated and untreated). 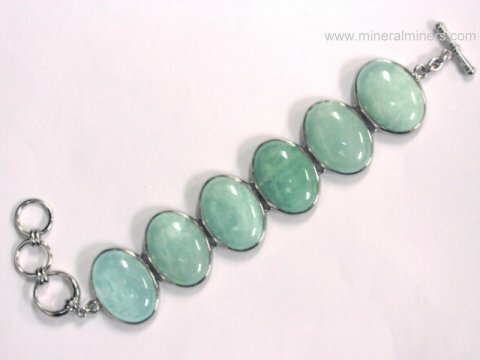 The photo at left shows a close-up of this natural aquamarine bracelet. See also a full view photo of this handcrafted aquamarine bracelet. Natural aquamarine bracelet set with 132 carats of cabochon gems! This unique aquamarine bracelet was handcrafted in sterling silver and then bezel set with open back settings. It is set with six translucent to semi-transparent cabochon gemstones of natural aquamarine measuring 26x19mm, with a total gemstone weight of 132 carats! These large size genuine aquamarine cabochons have light blue-green natural color (they are unheated and untreated). This unique aquamarine with morganite bracelet was handcrafted in sterling silver and then bezel set with open back settings. It is set with five natural aquamarine cabochon gemstones of measuring 26x19mm, and with five 9mm round cabochon gems of natural morganite! The cabochons are all translucent to semi-transparent. We also carry an assortment of stands for small & medium sized spheres and mineral specimens. This is the end of our Aquamarine Spectacular Items page. We have a large variety of genuine aquamarine jewelry designs in stock including aquamarine necklaces, pendants, aquamarine earrings, bracelets and aquamarine rings. We have these natural aquamarine jewelry items available in pure 925 sterling silver and also in solid 14k gold. Our aquamarine rough is all untreated natural aquamarine! We don't have any man-made aquamarine or diffusion treated aquamarine - just real untreated aquamarine. You may have noticed that some of our aquamarine has pale green or greenish-blue color, that is because we do not heat treat any of our aquamarine. Most Brazilian aquamarine has natural greenish to greenish-blue hues when discovered in the earth. Many gem dealers heat these pale green and greenish-blue color aquamarines to remove the green hues resulting in the pure blue "heated" aquamarine color. Here at mineralminers.com, we do not heat or treat any aquamarine! 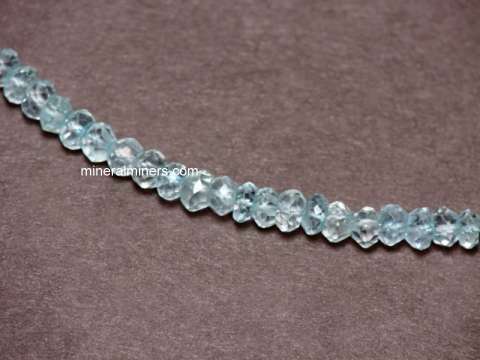 We specialize in superior quality natural color aquamarine that was mined in Brazil. To see more aquamarine photos, just select another item category from the table below. To see photos of another mineral variety, select any item category link in our Mineral Inventory & Factsheet Index. Would you like us to inform you when we add more spectacular natural color aquamarine collector quality items on this page? 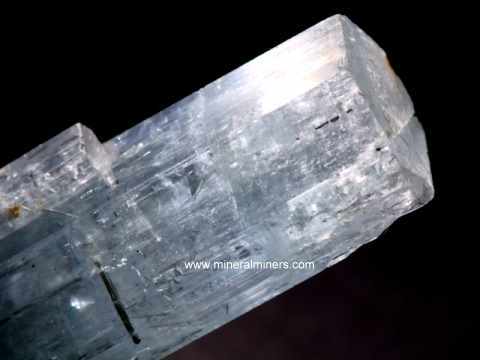 We have a large inventory of natural aquamarine crystals, gemstones, mineral specimens, rough, spheres, and jewelry items in stock at our mineral warehouses, so be sure to let us know if you have any aquamarine special requests. Please contact our webmaster or our 'site' geologist with any questions or comments.